1. Last Sunday was the first in the seven-Sunday Season of Easter. The risen Jesus, the New Testament tells us, walked among and taught His followers for forty days following His resurrection. (Paul says that more than five-hundred of Jesus' followers, or disciples, saw Hims after His resurrection.) The Easter season therefore, incorporates forty days plus ten days, recalling the time between Jesus' ascension into heaven and the sending of the Holy Spirit at Pentecost, traditionally described as the birthday of the Church. 2. This Sunday, as on all the Sundays of Easter, the only lesson from the Old Testament is the Psalms. Usually, the first lesson also comes from the Old Testament. But during Easter, the first lessons are drawn from the New Testament book of Acts. Acts is the second volume of Luke the Evangelist's two-volume work, the first being the Gospel that bears his name. Acts gives the early history of the Church from the day of the resurrected Jesus' ascension through approximately 60-65AD. It recounts the tale of how a group of not especially reliable witnesses of Jesus' ministry, death, and resurrection carried the Good News that forgiveness of sin and new life belongs to all who believe in Christ first to their fellow Jews and then into the world beyond. Within thirty years of Christ's resurrection, the Church was becoming established and growing throughout the Mediterranean basin. Acts says that this happened not because the first Christians were more able than others. Nor did they gain thousands of converts through power or coercion. The early Church knew the truth of Paul's affirmation that believers are their strongest and most convincing when they are weak, that is, dependent not on themselves, their own cleverness, or their native persuasiveness, but when they are utterly dependent on God's Spirit to give them strength and inspiration. This fact may explain why the Church of today is in the greatest risk of extinction in places where Christians are likelier to be more well-off and comfortable. Wealth and ease can delude us into believing that we are self-sufficient. In places like Africa and Asia, people know better. There, the growth of the Church makes Christianity, in 2008, the fastest-growing religion in the world. 1. Acts 2:14a, 22-32: The first lesson is part of the sermon which the apostle Peter preached on the first Pentecost and that will be the first lesson on Pentecost Day in a few weeks. In both of his New Testament writings, Luke, himself a Jew, perhaps writing to a predominantly Jewish audience, is at pains to emphasize the consistency between the Old Testament and the ways in which God revealed Himself to ancient Israel and the ministry of Jesus in New Testament times. Foreign to Luke and the incidents he recounts both in his Gospel and in the ministry of the early Church is any notion that Jesus represents a "new covenant" (or a "new testament"). That's an idea gets more from reading John's Gospel. In this lesson, as in Jesus' appearances to the two disciples on the road to Emmaus, the emphasis is to show how Jesus fulfilled what God always planned to do from Old Testament times. 2. Psalm 16: In his sermon recorded by Luke in Acts, Peter quotes from Psalm 16, although he takes some liberties with the passage, presumably because, as happens when I teach classes sometimes, he's citing it from memory. 3. The psalm is called, "A Miktam of David." As explained by a note in The Life Application Bible, "Miktam comes from a term that may mean 'to cover.' It could mean a covering of the lips, a silent prayer, or a prayer to be covered (a plea for protection)." 4. What so intrigues me about this psalm is its emphasis on human volition in choosing one's god. (Our "god" is whatever is of ultimate importance to us. The Bible emphasizes that there is really only one God and urges all people to choose Him as their ultimate foundation and allegiance.) In verse 4, we're told, "Those who choose another god multiply their sorrows..." In verse 5, the psalmist declares, "The Lord is my chosen portion..."
5. 1 Peter 1:3-9: First Peter, one of my favorite books of the Bible, is a letter meant to be circulated among Christians living in Asia Minor, located in what is today Turkey and part of the Roman Empire. Traditionally, it's been believed that this letter was written about 62AD to Christians facing persecution and marginalization for their faith in Christ. 6. Here, Peter calls attention to how God can use our trials of faith to strengthen our faith, increasing our dependence on the God we know through Jesus Christ. 7. Verses 8 and 9 anticipate our Gospel lesson and may reflect Peter's memory of the very incident involving Thomas and Jesus that makes up part of it. The "outcome of your faith" in Christ, Peter tells believers who never saw Jesus, is "the salvation of your souls." The same promise belongs to believers in Jesus today. 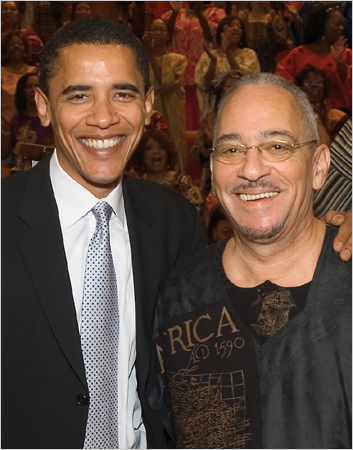 I've withheld expressing any opinion on the pronouncements of Jeremiah Wright, former pastor of Trinity United Church of Christ in Chicago and Barack Obama's former pastor. One reason for this is that my schedule has been so busy lately that it wasn't until a few days ago that I'd had the chance to look at the videos everyone has been talking about. In fact, I hadn't even looked up Wright's sermon excerpts until after I listened to Senator Obama's speech on race while working on some thank you notes the other night. So, to some extent, I've experienced this controversy in reverse order: first, Obama's call for racial conversation, then, Wright's incendiary sermons. Furthermore, I've never understood how Christians could be antisemitic. The Savior we follow, Who we believe was both God and human, was Jewish. The Jewish people were the womb and cradle of our Lord. The first Christians were all Jews. Wright's comments are bound to cause Senator Obama further grief as he tries to nail down the Democratic nomination for president, both distancing himself from Wright's sentiments and embracing him as his spiritual "uncle." There are important questions to be considered when it comes to Obama's twenty year association with Wright. After so long an association with Wright, it will become increasingly difficult for people to believe that Obama was unaware of the seeming depths of Wright's prejudices. But I will lay the political questions aside. To me, the far more important questions raised by the Wright debacle are spiritual, particularly the effect the former pastor's incendiary rhetoric has had on the public's perceptions of Christian faith and whether his sentiments represent Christianity. In an intriguing column, Martin Marty, a grey eminence of my own Lutheran movement, talks about his long association with Jeremiah Wright. Wright was a student of Marty's at the University of Chicago. He describes a warm association that included frequent visits to Trinity, where he and his wife, both white, were welcomed lovingly. He describes sermons in which he heard the Gospel of Jesus Christ--what Christians scholars call "the kerygma": the good news that God so loved humanity that God the Son entered our world, submitted to universal condemnation by the human race, died on a cross, and rose from the dead to give life to all who turn from sin (repent) and trust in Christ as Lord. That's an important statement, especially coming from a Lutheran. If you're at all familiar with the Lutheran theological tradition, you know it began with theological concerns, concerns that the Word of God as seen on the pages of the Bible, was being shunted aside or not given its proper place as--in phrasing most Lutherans know or have heard a million times--"the authoritative source and norm of our life, faith, and practice." One of our confessions affirms that the Church can be identified as the Church solely because in it, the Gospel is rightly proclaimed and the Sacraments are rightly administered (Article 7, The Augsburg Confession). Lutherans have always been sticklers for the belief that when anyone dares approach a pulpit when God's people assemble for worship, the Gospel--the Good News--and the Word of God must be proclaimed. According to Martin Marty, he heard Jeremiah Wright adhere to that injunction whenever he preached at Trinity United Church of Christ. That is something to be considered as we delve into Jeremiah Wright's disturbing statements. But there seem to have been other messages being sent by Jeremiah Wright and Trinity over the past thirty years. What were those messages? Were they at variance with Christian teachings and belief? I hope to look at these and other questions over the next several days. *I was a voting member at the Churchwide Assembly of the Evangelical Lutheran Church in America (ELCA) when we repudiated the antisemitic writings of Martin Luther and apologized to the Jewish community for them. Luther's antisemitic writings were never part of the confessional documents of the Lutheran movement, although his antisemitism both reflected sentiments extant in Germany in the 16th.-century and later and may have provided philosphical undergirding to the tragedy of the Third Reich. **Marty also repudiated Wright's close association and commendation of Louis Farrakhan and his belief in the notion that the US government created the AIDS virus to infect African-Americans. He also reserves the right to more harshly adjudge Wright with the development of more information. ***The quote is from the Old Testament, Habakkuk 2:4. The idea is that we are called righteous, right with God, not because of our moral rectitude or our membership of a particular ethnic group, but solely because we repudiate our sin and trust in the God revealed first to Israel and, we Christians believe, ultimately in Jesus of Nazareth. It looks like I'm not the only one. The way I see it, on the Democratic side, Hillary Clinton cannot win the nomination and is unelectable...too many negatives...and Barack Obama has been rendered equally toxic by the Jeremiah Wright debacle. But those uncommitted superdelegates just might save the day for Dems, after all. Here's how: The superdelegates could remain uncommitted through the first ballot of the convention. Neither Obama or Clinton would then have enough votes to win, freeing their delegates to go elsewhere on the second ballot. The sd's, ostensibly leaders of the party, then could reveal their choice, maybe Bill Richardson or Joe Biden. The convention could spend a ballot or two moving in that direction and then, after nominating the sd choice, give the vice presidential nomination to, say, Dianne Feinstein. Of the three finalists on the Democratic side--Obama, Clinton, and John Edwards, the Senator from Illinois had the most substative experience, both in terms of time in elective office and relevant leadership experience. But the credentials of all three can't compare to those of Richardson, Biden, or Feinstein. I shared this bizarre scenario with my son on Tuesday. Yesterday, in a comment on one of my posts at The Moderate Voice, someone else mentioned the same fantasy. It isn't likely to happen. But, to quote the Animals, "we've gotta get out of this place" and this scenario may be the only thing to free us from this crazy, nasty, brutish campaign. Last year, before the presidential campaign turned him once more into a Clinton attack hound, James Carville lamented his party's penchant for stealing defeat from the jowls of victory. By this pre-convention campaign, the tone of which both he and his former boss so sanguinely endorse, the Democratic campaigns seem intent on giving John McCain a pass to the White House and making Carville look like Kreskin. Assuming that neither Obama or Clinton go to the convention with enough delegates to win, an intervention on the part of the superdelegates may be the only thing that can salvage Democratic prospects. Until then, as it relates to the presidential campaign, I'm tempted to go on sabbatical. Maybe I'll go to Australia. I've written before about my long-ago acquaintance with Sherrod Brown, Ohio's junior US Senator. Brown was a very young member of the Ohio House of Representatives when, in 1979, I spent a year as Supervisor of Pages. He was always personable and without pretense, in spite of having won election to the House at a very young age and his obvious intelligence, two things that could have made one so young a bit full of himself. Yesterday, after not running into Brown in twenty-eight years, I had the chance to speak with him. I'd been asked to participate in a community leaders roundtable, the ninety-first such event that Brown has held around the state since becoming Senator in January, 2007. Frankly, I had little to offer, having only been in Logan for about five months (though a resident of Ohio for all but about a year-and-a-half of my 54-plus years.) But it was encouraging to see that Brown is still the cheerful, warmhearted, and personable character he always was. I also liked the fact that his shoes were even uglier than mine, these dimpled black things with suction cups on the bottom. "They're comfortable," he said simply. Sometimes officeholders ensconce themselves in arrogance and pomp. And sometimes, those of us who observe them ascribe nasty motivations to them. But first and foremost, these people are people. It appears that Brown hasn't forgotten that and that's refreshing. I don't know that Brown got a lot out of the meeting that he didn't already know, although I was incredibly impressed with the knowledge and the dedication of the community leaders present. They included agency directors, some county and community elected officials, businesspeople, and so on. This too, was an important reminder. Sometimes, wherever we may live, we think that the most capable people are "someplace else." What I saw yesterday underscored the fact that often, they're "right here." As for what our community got from Sherrod Brown's visit, I would say that most of all, it got the sense that its junior United States Senator is willing to listen to them. It's derisively called the "Not Invited Tournament." Its winner is said to be the sixty-fifth best team in the country for its failure to make it into the NCAA tourney. But this Buckeye fan would be extremely pleased if Ohio State's young team with a great future won the National Invitational Tournament (NIT). The team took a step toward that goal with yet another win tonight. Should Senator Clinton Withdraw from the Race for President? How could anyone seriously believe that, after the brutal and dishonest behavior of the Clintons since Super Tuesday, February 5th, that the American people, exhausted by the brutal and dishonest Bush administration, would lift Hillary and Bill Clinton up to electoral victory and return them to four more years in the White House? How could anyone seriously believe that Obama supporters would now vote for Hillary Clinton in 2008 (or possibly ever)? Such fantasies defy good common sense and all rules of logic. Yeah, this race is so over. The only remaining question is... what Democrat possesses the backbone and requisite muscle to tell the Clintons that it's over, and to enforce it? I'm not interested in the validity of White's arguments per se. I don't do endorsements around here. What's so striking about White's column is that she is such a reasonable person, not given to lashing out at fellow Democrats. Her anger may be some indication of the antipathy rank and file Democrats are feeling these days. If White's column measures many of her fellow Democrats' sentiments, they want the nomination fight to be over so that they can fight Senator John McCain. Clinton's supporters have been saying that the Senator should remain in the race at least until "the remaining ten states have been heard from." But will that enhance the Democratic nominee's chances in the fall? Increasingly, that's the question that people like White are raising. But will the people to whom Senator Clinton is likely to listen raise it? "Letters to My Non-Churchgoing Friends"
A young preacher was going through a crisis of faith. His ministry as an evangelist was growing, but he was beginning to have doubts about God’s existence, about the veracity of the Bible, about the reality of Jesus’ resurrection. It didn’t help that a friend of his, another young evangelist described by the first young man as “the best preacher I ever heard,” had lost his will to believe. A superficial reading of science had led the second young preacher to reject God. “Nobody believes what you believe any more,” he told the first young preacher. It was a hard time for that young man. The beliefs on which he’d built his life seemed to be crumbling around him. Then, one night, on a walk through a field in southern California, he fell to his knees. He cried out to God as he clutched his Bible with desperate hands. Lord, he said, I don’t understand everything in this book. But with your help, I will trust the message on these pages. I will trust that there is a God Who so loved the human race that He entered our human story, died on a cross for our sin, and then rose from death so that all who believe in Him will never die, but be with you for all eternity. That proved to be a turning point in the life of the young preacher. From that moment forward, Billy Graham's faith grew stronger. Sometimes, I think, we have the wrong idea about faith in God. We think that we have to convince ourselves or get worked up with an ocean of goose bumps. But faith is not something we can manufacture. We can’t educate ourselves into it, like we do with the multiplication table or the conjugation of verbs. We can’t hold our own little pep rallies in order to create the feeling of faith within us. Faith--which is just another word for trust--isn’t something that comes naturally to we human beings. Faith in God, in the God of Easter, in the risen Savior Jesus, is God’s gift to those who are willing to believe. This may explain the really strange thing that happens in Matthew’s telling of the story of the first Easter morning. Each of the four Gospel writers—Mark, Luke, John, and Matthew—tell us about what happened on the first Easter in their own ways. They differ on some of the specifics. That has never bothered me. If all four of them agreed on every single detail, I would smell a conspiracy. As it is, I smell the truth. At that point, the women hadn’t seen the risen Jesus. They were told that if they and Jesus' other folowers traveled the sixty miles to Galilee from Jerusalem, they would see Him for themselves. Granted, the earthquake they experienced at the tomb, the fainted guards, and the angel lighting on the stone that had been rolled away all were pretty impressive things, signs that could point them toward belief. But Jesus’ followers had seen and heard lots of impressive signs of Who Jesus was in the preceding three years. Still, they hadn’t really believed when Jesus told them He would die for the sins of the world and rise to give new life to all the repentant who believe in Him. When Jesus breathed His last on the cross, they were as hopeless as atheists, as forlorn and defeated as anyone who turns their back on God. Someone has said that the mixture of emotions that the two women felt as they ran from the tomb—fear and great joy—is like that mixture of emotions felt by brides and grooms as they prepare, hearts pounding out of their chests, to walk into a church sanctuary on their wedding days. They have no idea what the next fifty or sixty years may bring. They have no certainty that they can trust either themselves or their beloved to be worthy partners in life. But they’re willing to trust that no matter what—in sickness or in health, in good times or in bad—that their marriages will work. The women, like a couple about to be married, didn’t know what the future might bring. They had no more certainty than Billy Graham did that night he threw himself on God’s mercy, that Jesus had really conquered sin and death for all who dare to trust in Him. But they were willing to trust and so, their hearts pounding from their chests, they ran to tell the disciples that the angel had said that Jesus was alive. But a funny thing happens in the lives of those who are willing to believe. They learn that the old saying is completely wrong. Seeing isn't believing. Believing is seeing! The president of Trinity Lutheran Seminary during the years I attended there was Fred Meuser. Once, shortly after I started seminary, Dr. Meuser took six of us who had begun our training in the middle of an academic year, out for lunch. We asked him to tell us about himself, especially about how he came to faith in Christ. “There’s no drama in my faith story,” he told us. “I grew up in a Christian home. My father was a Lutheran pastor in churches all around Michigan.” At that, I thought I saw tears well in Fred's smiling eyes. “I don’t remember a time when I didn’t believe in Jesus,” he told us. Nurtured in faith from the time he was a baby, Fred had never rebelled. He had always wanted to believe in Jesus and he found that God builds faith in those who are willing to believe. Many of you know something of my own faith story. In my teens and early twenties, I considered myself an atheist. Then, I married this Lutheran. The faith I saw in Ann and all the wonderful people of the congregation that became my home church made me want a piece of that action. I wanted to know and follow Jesus! I wanted to believe, but frankly, a part of my skeptical mind rebelled even after I'd made public professions of faith. I wanted to believe, but still didn't fully. Then, one night a strange thing happened to me. I had a dream that I remembered. That almost never happens. I dreamed that I was walking down a street. Nobody else was there. Nobody, that is, except for one figure who kept walking closer and closer. Ultimately, he approached me and I could see that it was Jesus. No words were spoken. In my dream, Jesus simply reached out His arms and pulled me to Himself. That was it. I remember waking up with a smile on my face. My willingness to believe in Jesus had become faith. When the women ran from Jesus’ tomb, the Lord they weren’t supposed to meet until they were in Galilee showed up. Matthew writes: “Suddenly Jesus met them and said ‘Greetings!’ And they came to Him, took hold of His feet, and worshiped Him…” God creates faith in those willing to put their dukes down and simply let God love them! When we allow ourselves to trust in Jesus that we see Him, see His grace, see His power, and see His love working in our lives. There are many people in this sanctuary this morning who can testify to that truth! As a pastor for twenty-four years now, there is one single statement I’ve heard from people more than any other. It comes in various versions. But it’s the same statement nonetheless. Atheists will tell me, “I just can’t bring myself to believe.” Faithful Christians will tell me, “My faith isn’t strong enough.” Or, “I’m not close enough to God to be a witness for Christ.” These statements all betray a single, common, human, and very understandable misconception. They all see faith as something we do, as the product of our effort. But the Good News of Easter is that Jesus has done everything necessary for our salvation. The Father sent the Son. The Son died and rose for us. The Spirit works in the wills of those who are willing to believe. The women who ran from the tomb to share the message of the first Easter learned what every believer in Christ has learned these past two-thousand years: If we are willing to believe, God will build faith within us. God will help us live in the certainty that the risen Christ gives all who believe infinite, indestructible forgiveness, life, and hope. God will build certainty in us that a risen Savior is by our sides in all that comes to us in this life and He has the power to give us life beyond the grave. If you and I are willing to believe—willing to meet the risen Jesus in worship, in the fellowship of believers, in the Sacrament, in the Bible, in prayer, in service in Jesus’ Name, our faith will grow. Our faith will invite others to follow. Our faith will show the world that there is a Savior Who died, but has risen. Risen indeed! Happy Easter, everyone.